Only for the The Black Rabbit are reasonable requests for original documents, which he claims exists, considered "spoonfeeding". IOW, he cannot produce the documents and resorts to dodging. There's no other way to describe it. If they were "easily found on the internet" he would easily produce them. Rabbit knows he's in over his head and is now running away. Imagine this guy in a legit court of law, it would be a bloodbath. Rabbit attempts to cover for his guru, Mattogno. Yet Mattogno has failed to produce documents necessary to buttress his position, so naturally Rabbit cannot produce them either. But hey, Mattogno is an authority who must be covered at all costs. Rabbit has let his man crush interfere with detached reasoning. Note that the Rabbit dodges the fact that Auschwitz numbers are easily accessed on, well, some individuals who were at Auschwitz. Within all the dodging The Rabbit engages in there is none more important than his inability show us a forensic report indicating phosgene on/in any of the alleged human remains or on the walls of the alleged 'gas chamber'. In fact he cannot show us proof of human remains. Laughable in the extreme. And I guess that's why you nor anyone else can show us these phantom pictures. You now say that there is a document which "mentions" some phantom "findings", but there is no actual "findings". Now that is laughable. This is truly getting better by the minute. Show us what you claim exists, Rabbit. Clearly we're seeing another case of false gassings. This is an alleged massive crime, therefore all efforts should have been made to collect and store all the evidence, that obviously did not occur. Until all requested documents, studies, reports, and physical evidence are actually shown we are left with nothing more than media created hype. Mattogno simply missed this one, rare for him, but his lack of evidence here speaks for itself. Rabbit has clearly blundered and has a issue of pride to now deal with. C'est la vie. And like so many Germans arrested after the war, August Hirt conveniently "committed suicide" before going to trial. The Allies certainly didn't want him spoiling what they had planned. It's noted once again that TheBlackRabbitofInle can produce no proof of 'phosgene gassings'. Over at Holocaust Controversies Jonathan Harrison has weighed in on the Natzweiler gassing issue, no doubt inspired by the recent findings in Strasbourg. And Harrison took the wise move of at least familiarising himself with the case by reading—seemingly just bits of—a few online sources before he announced his judgment of what really happened 72 years ago in Naztweiler. Below I'll quote his post in full, but please see his original for his hyperlinked sources. This photo shows an autopsy photograph of Menachem Taffel, who had been gassed at Natzweiler. His body was one of 86 found at Reichsuniversität Strasbourg upon its liberation, whereupon autopsies were carried out by Professor Camille Simonin. At the end of the 1960s, when the district attorney of Frankfurt initiated inquiries into Bruno Beger and Hans Fleischhacker, the former concentration camp prisoner, Hermann Langbein, saw a photograph that had been taken during the autopsies among the collected evidence. This photograph depicted a body with a number on his left forearm (Fig. 6). 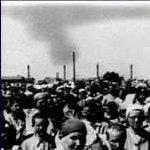 With the support of the archives in Auschwitz he succeeded in identifying the dead man as Max Menachem Taffel. Menachem Taffel, a Jew born in Galicia, was last known to have been a milkman who had lived with his family in Berlin. From there he was deported to Auschwitz along with his wife and his 14-year old daughter on March 12, 1943. Apparently no one knew that the autopsy protocols had been preserved and thus Menachem Taffel remained for decades the only victim, for whom the prisoner’s number had also been associated with a name. Evidence of the gassing includes the "Bautagebuch" [building diary] shown here and Kramer's interrogation [here]. Evidence of the gas chamber itself is here. I find it strange that prosecutors blaming a defeated country for alleged giant mass gassings wouldn't have used letters openly dealing with smaller homicidal gassings if such documents had been available to the prosecution team at that time. Moreover "experiments on human beings in connection with the poison gas or poisoned chemical" were evoked during Sievers' interrogation. So why not talk about the alleged homicidal gassings at Natzweiler at that time?? I just read through Sievers' actual interrogations transcripts at Nuremberg (not his examination in the court, which is what you linked above); there are a total of three interrogations, held on 29.08.45, 30.08.45 and 06.09.45. He was ask numerous questions about Prof. Hirt, and at one point Natzweiler is mentioned by Sievers, but at no point does the matter of Hirt's skeleton collection come up nor homicidal gassings; although there was mention of Hirt doing experiments on the effects of "Lost gas". During his IMT testimony which you linked, 'Brandt to RSHA Nov 6, 1942' is mentioned, which is document NO 089, and it makes no mention of gassings, which suggests why Sievers wasn't asked about them by the British prosecutor Major F. Elwyn Jones. Whether any of the other letters regarding the matter were also available to the IMT, I don't know, but the prosecution exhibit list for the NMT "Doctors' Trial" states that the documents relating to the Jewish skeleton collection were offered into evidence on December 18 or 19, 1946. Although Included in the list in NO 089, which we know was submitted by the British to the IMT on August 8, 1946 as GB-573. On the face of it, it seems these letters were found probably in 1946. If you read through Pressac's The Struthof Trial (online version here, see pp.69-73. ), you'll see copies of numerous other documents that the French found at the camp. Copies of most of these were forwarded to Nuremberg in November 1946 with the covering certificate authored by the French detective chief Eugène Helffer. BRoI wrote: I see that you choose to clip the first part of your quoted Bilik sentence, i.e. "It is evident that Kramer lies on several points to introduce doubt about the validity of his sworn statements;"
"I placed a fixed quantity of the salts in a funnel attached below and to the right of the peep-hole</i> [a glass covered observation aperture]<i>. At the same time, I poured in a fixed amount of water which flowed, together with the salts, into a pit made inside the gas chamber under the peep-hole. Then I closed the opening of the funnel by means of a tap, fitted into the bottom of the funnel, which ran into a metal pipe. This metal pipe took the salts and the water into the pit inside the gas chamber,"
Perhaps one of the French speaking posters here would be good enough to offer their opinion on Green-Krotki and Lang's translations, as to which is the more accurate. If these newly "discovered" gassings in French city of Strasbourg were true, why aren't they being pushed in every western news outlet (often heavily dominated by zionist jews) ? A bit off-topic: to me this sounds like the soap story from Gdansk (Poland) anatomy institute were this german professor (Spanner, IIRC) allegedly cooked soap out of corpses from POW camps. That story changes every time somebody tells it; sometimes it was jewish corpses, sometimes it was soap bars that he made, sometimes a liquid cleaning agent, sometimes it was a one-time experiment, sometimes industrial etc.